The Hyatt Regency Greenwich lies in the heart of Old Greenwich, a historic southwest Connecticut neighborhood found right on Long Island Sound. 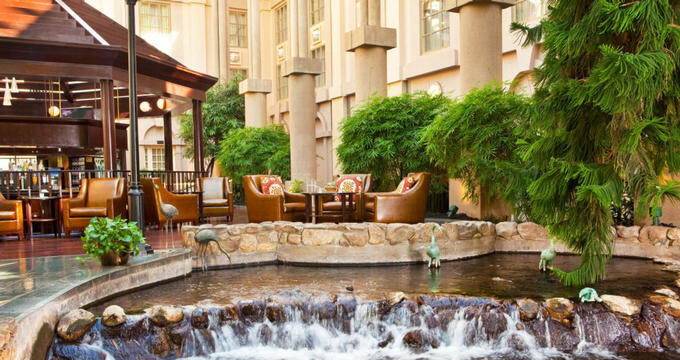 Despite its modern accommodations and fine dining options, the hotel reflects the town’s historic charm with lush gardens, a gazebo and flowing fountain under the sky lit atrium. A wide range of professional planning services, venues and nearby attractions make the Hyatt Regency Greenwich the perfect setting for a wedding, business meeting or family vacation. The hotel at Hyatt Regency Greenwich offers 373 rooms and suites in several styles, each with modern decor and furnishings, comfortable seating and workstation, free wireless Internet, large flat screen TVs and in-room refrigerators. Guests can choose standard rooms from 265-230 square feet with either one King or two double beds. Atrium View and Regency Club rooms offer the same accommodations with views of the hotel’s atrium, plus a granite bath in the Atrium View King room and access to the Regency Club Lounge for guests staying in the Regency Club rooms. The larger Deluxe rooms include a sitting area with chaise lounge, King-sized bed, and deluxe granite bath in 385-500 square feet of space. The hotel also offers allergy-friendly rooms and ADA-accessible rooms with accessible showers and tubs. The 800-square-foot Greenwich Suite features a walk-in closet, oversized King bed and living area overlooking the hotel grounds. The Fairfield Suite includes a dining table for four, separate bedroom with King-sized bed and 930 square feet of space. The hotel’s largest accommodation, The Presidential suite spans 3,294 square-feet with a private King master bedroom, large sitting area, and dining table for six. Winfield’s at Hyatt Regency Greenwich serves East Coast cuisine with regional favorites for breakfast and dinner. Guests can grab a complimentary coffee or tea throughout the day from the Torrefazzione Italia beverage bars located on every guestroom floor. The Gazebo Bar & Grill in the hotel’s sky lit atrium sets the scene for a romantic meal near the pond and water fountain, or happy hour drinks and shareables in the al fresco bar. Room service is available for an in-room meal or snack. Hyatt Regency Greenwich offers services and venues to accommodate both simple and elaborate weddings. Professional wedding planners are available to help couples choose from three venues, themed wedding options and custom catering services for up to 1,200 guests. The hotel also offers special overnight rates for wedding guests and complementary honeymoon room nights. The event planning and catering staff can also help plan business meetings and conferences hosted at the Hotel. Gor guests needing business center access 24/7, they can find complementary transportation services connect guests with off-site meetings and events. Hyatt Regency Greenwich offers a glass-enclosed heated lap pool and whirlpool in the hotel atrium. A 24-hour fitness center comes equipped with cardio and strength-training machines and free weights. Regency Club members have exclusive access to the Regency Club Lounge, with complimentary continental breakfast, beverages, snacks and more. Several cultural attractions lie within just 5 miles of The Hyatt Regency Greenwich. The Greenwich Public Library houses the Flinn Gallery, showing the work of local and regional artists including glasswork, botanical prints, and photography. The historical Bush-Holley house served as a boarding house for artists and writers during the 18th century and now shows American impressionist pieces and features a recreated artist’s studio. The Bruce Museum began as the home of a wealthy textile merchant in 1853. The home now features exhibits on natural history, anthropology, and fine art. Hotel guests can also find plenty of green space near the hotel. The Babcock Preserve is the largest park in Greenwich and covers 300 acres of wooded trails for hiking, biking, wildlife viewing, picnicking, and horseback riding. Located in the heart of Old Greenwich, Binney Park offers waterfront views, scenic walking trails, a seasonal ice-skating pond and large playground. The nearby E. G. Brennan Golf Course is a public 18-hole course with a full-service restaurant onsite. For more outdoor recreation, Bruce Park includes a baseball diamond, three tennis courts, and a croquet court on 60 acres of green landscapes. Families can also spend the day at Rye Playland, a theme park with roller coasters, mini golf, and carnival rides and games. Shopping along Greenwich Avenue includes fine clothing, jewelry, and gifts with a small-town main street feel.